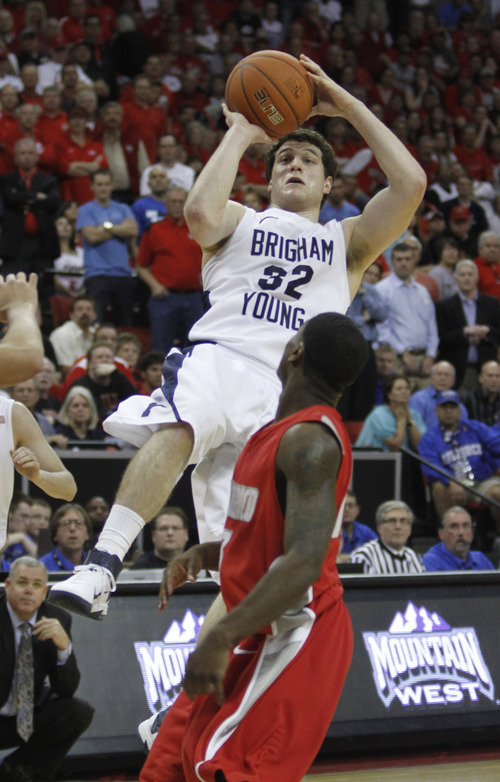 With a school-record scoring binge, Jimmer lifts Cougars to win. Rick Egan | Salt Lake Tribune BYU guard Jimmer Fredette (32) shoots as New Mexico guard Jamal Fenton (13) defends for the Lobos, in the Mountain West Conference Championships, BYU vs. New Mexico, in Las Vegas, Friday, March 11, 2011. Fredette had 52 points in the Cougar victory. Rick Egan | Salt Lake Tribune BYU guard Jimmer Fredette (32) drives up the middle, as New Mexico guard Jamal Fenton (13) defends for the Lobos, in the Mountain West Conference Championships, BYU vs. New Mexico, in Las Vegas, Friday, March 11, 2011. Rick Egan | Salt Lake Tribune BYU guard Jimmer Fredette (32) shoots for the Cougars, as New Mexico guard Curtis Dennis (3) defends, in the Mountain West Conference Championships, BYU vs. New Mexico, in Las Vegas, Friday, March 11, 2011. 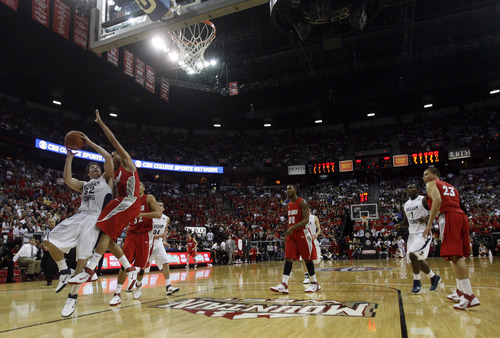 Fredette had 52 points for the Cougars in their 87-76 win over the Lobos. Rick Egan | Salt Lake Tribune BYU guard Jackson Emery (4) dunks the ball for the Cougars, in the Mountain West Conference Championships, BYU vs. New Mexico, in Las Vegas, Friday, March 11, 2011. Rick Egan | Salt Lake Tribune New Mexico fans turns away as BYU fans celebrate as Jimmer scores his 50th point, and the Cougars extend their lead over the Lobos, in the Mountain West Conference Championships, BYU vs. New Mexico, in Las Vegas, Friday, March 11, 2011. Fredette had 52 points for the Cougars in their 87-76 win over the Lobos. Rick Egan | Salt Lake Tribune New Mexico fans turns away as BYU fans celebrate after Jimmer scores more than 50th points, and the Cougars extend their lead over the Lobos, in the Mountain West Conference Championships, BYU vs. New Mexico, in Las Vegas, Friday, March 11, 2011. 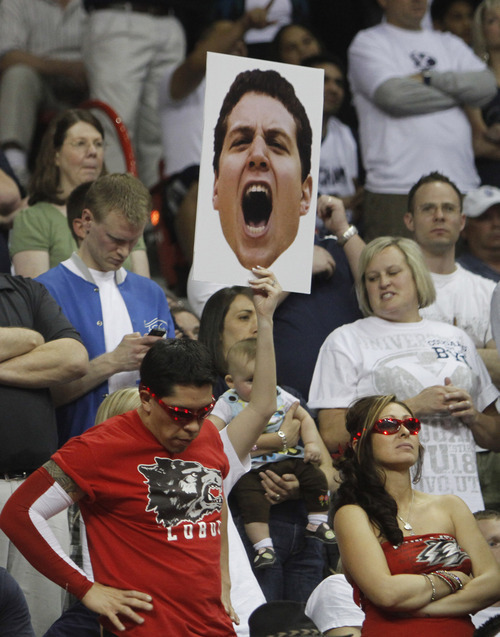 Fredette had 52 points for the Cougars in their 87-76 win over the Lobos. 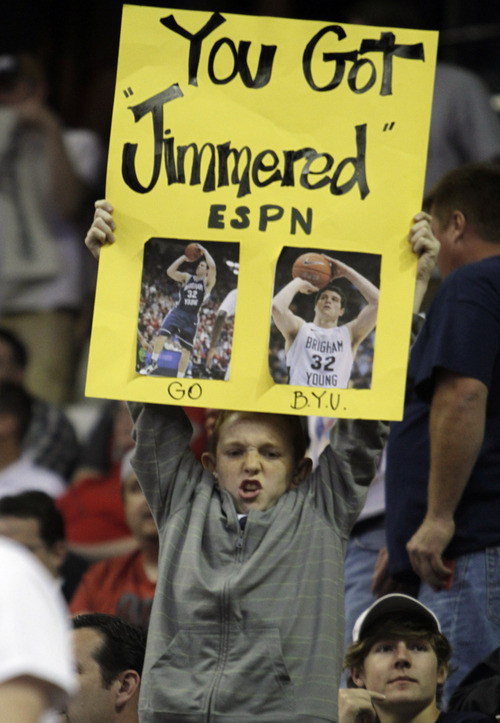 Rick Egan | Salt Lake Tribune Cougar fan cheers for Jimmer, in the Mountain West Conference Championships, BYU vs. New Mexico, in Las Vegas, Friday, March 11, 2011. Rick Egan | Salt Lake Tribune BYU guard Jackson Emery (4) passes the ball off, in the Mountain West Conference Championships, BYU vs. New Mexico, in Las Vegas, Friday, March 11, 2011. Fredette had 33 points for the Cougars in the first half. Rick Egan | Salt Lake Tribune BYU guard Jimmer Fredette (32) shoots for the Cougars, as m10 defends, in the Mountain West Conference Championships, BYU vs. New Mexico, in Las Vegas, Friday, March 11, 2011. 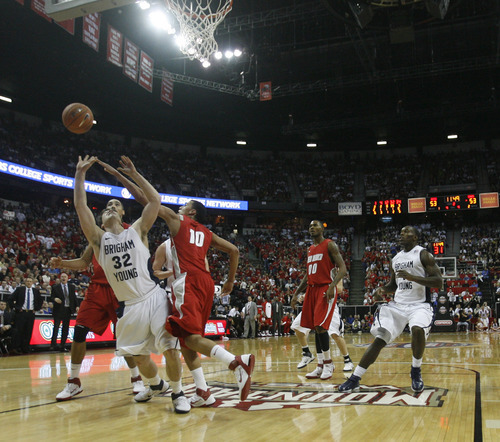 Fredette had 52 points for the Cougars in their 87-76 win over the Lobos. Rick Egan | Salt Lake Tribune BYU guard Jimmer Fredette (32) shoots for the Cougars, as m10 defends, in the Mountain West Conference Championships, BYU vs. New Mexico, in Las Vegas, Friday, March 11, 2011. Fredette had 52 points for the Cougars in their 87-76 win over the Lobos. 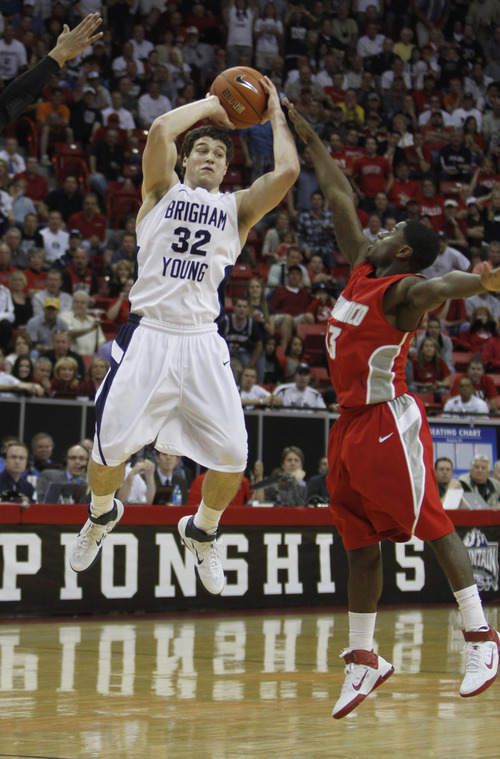 Rick Egan | Salt Lake Tribune BYU guard Jimmer Fredette (32) shoots for the Cougars, as A.J. Hardeman defends, in the Mountain West Conference Championships, BYU vs. New Mexico, in Las Vegas, Friday, March 11, 2011. 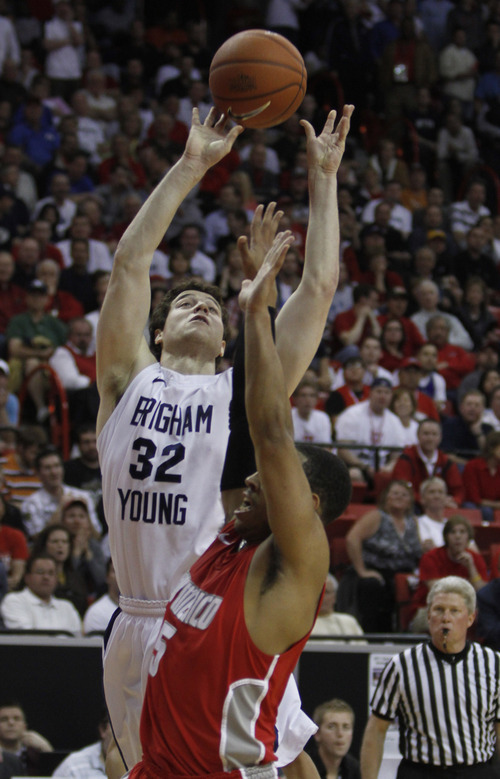 Fredette had 52 points for the Cougars in their 87-76 win over the Lobos. Rick Egan | Salt Lake Tribune BYU guard Jimmer Fredette (32) shoots for the Cougars, as New Mexico guard Dairese Gary (5) defends, in the Mountain West Conference Championships, BYU vs. New Mexico, in Las Vegas, Friday, March 11, 2011. Fredette had 52 points for the Cougars in their 87-76 win over the Lobos. Rick Egan | Salt Lake Tribune BYU guard Jimmer Fredette (32) shoots for the Cougars, as New Mexico guard Kendall Williams (10) defends, in the Mountain West Conference Championships, BYU vs. New Mexico, in Las Vegas, Friday, March 11, 2011. 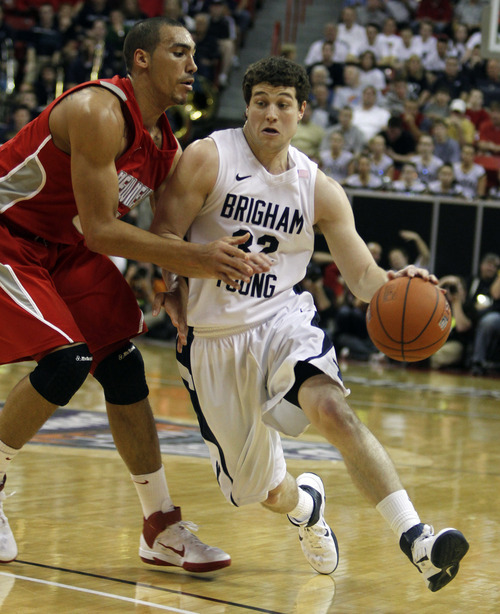 Fredette had 52 points for the Cougars in their 87-76 win over the Lobos. Rick Egan | Salt Lake Tribune BYU guard Jimmer Fredette (32) shoots for the Cougars, as New Mexico guard Kendall Williams (10) defends, in the Mountain West Conference Championships, BYU vs. New Mexico, in Las Vegas, Friday, March 11, 2011. Fredette had 52 points for the Cougars in their 87-76 win over the Lobos. Las Vegas • The best show in town wasn't on the famed Las Vegas Strip on Friday night. 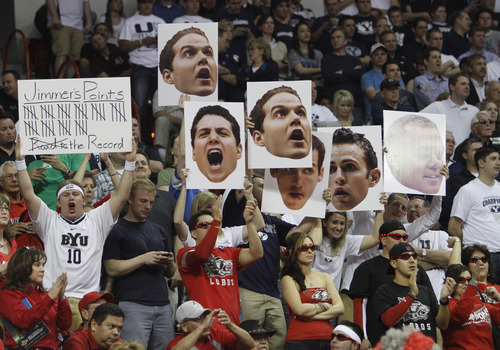 In perhaps the greatest performance of his remarkable All-America career, Jimmer Fredette broke conference, school and arena single-game scoring records  not too mention BYU's all-time scoring record  in front of a sellout crowd at the Thomas & Mack Center. The senior guard, perhaps solidifying his standing as the front-runner for National Player of the Year honors, erupted for 52 points as BYU throttled New Mexico 87-76 in a Mountain West Conference tournament semifinal game. The Cougars (30-3) will try to win their first conference tournament title in 10 years Saturday against the winner of the late UNLV-San Diego State semifinal, having swept both those teams in the regular season. More importantly, the win may have answered questions about BYU's viability as a highly seeded team when the NCAA Tournament Selection Committee examines its case without suspended sophomore center Brandon Davies. "It proved we're a good team," coach Dave Rose said. And one with a sensational player, a player who had the pro-BYU crowd chanting "You Got Jimmered" at the end of the game as Rose took Fredette out with 16 seconds remaining to a deafening roar of approval from the appreciative crowd. The win snapped a four-game losing skid for the Cougars against New Mexico, which pounded BYU at the Marriott Center 82-64 last week. "It was very satisfying to win that one. 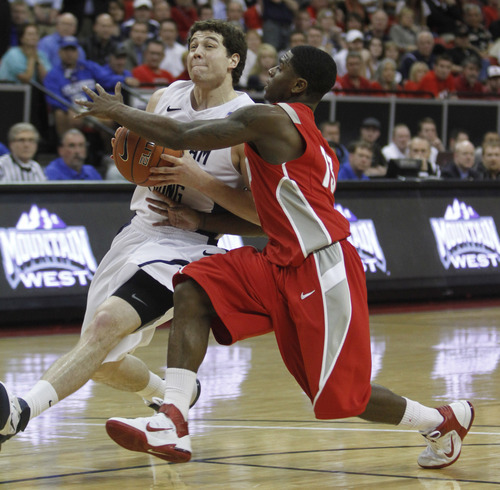 ... We knew we could play better than what we did in Provo," Fredette said. The Cougars caught a break when New Mexico's best player, point guard Dairese Gary, went down early in the second half with a knee injury. He did not return. "We missed him a lot, obviously," said Drew Gordon, who led the Lobos (21-12) with 17 points and 15 rebounds. Still, the Cougars led by just 62-61 when UNM's Kendall Williams hit a 3-pointer with just over eight minutes remaining. Fredette answered that with a three and then a two-pointer. Less than two minutes after Williams' bomb, the Cougars had a 74-65 lead and were running away with it. New Mexico coach Steve Alford said the team really missed Gary in the final four minutes. "He's been our bus. He's been our little bus. He's had a lot to do with our 97 wins," Alford said. BYU's Rose said there was "no question" that Gary's absence impacted the game. But the Cougars will take it, after having shot 50 percent from the field. The game featured 14 lead changes and eight ties, and a first half that was as well-played and entertaining as could be imagined. 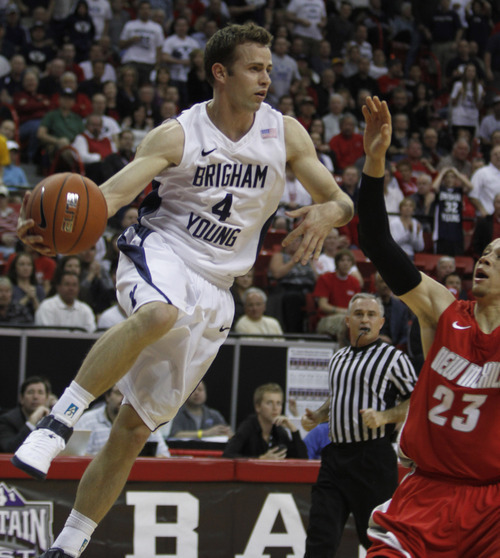 "It was a crazy atmosphere, but it kept us energized," BYU guard Kyle Collinsworth said. Added Fredette: "It was a great team effort and it was something I will never forget." Jackson Emery struggled again with his shot, going 3 of 11 from the field, but made up for it with five steals, including several that led directly to fast-break points. He also made six straight free throws to seal the win in the final 32 seconds, finishing with 14 points. As much as Fredette thrilled the crowd with as brilliant an offensive display as he has seen, Rose said it was still a "great team win." R IN SHORT • Jimmer Fredette breaks multiple scoring records with 52 points as No. 8 BYU exacts some revenge on New Mexico in an MWC tournament semifinal. P No. 8 BYU vs.San Diego State, 5 p.m.